I had promised Shern ages ago that I'll bring him sit the Rapid Penang bus. 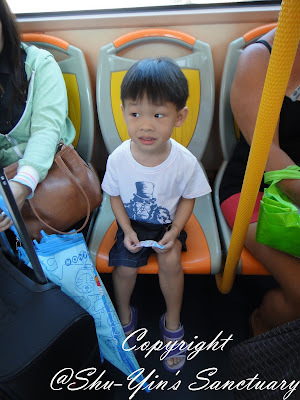 So sometime last month, we finally brought him for a to and fro bus trip. Shern got pretty excited about it. Woke up and was in a good mood. 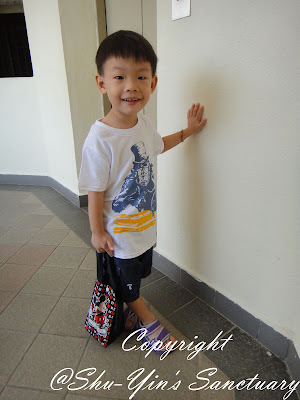 I changed him into a cotton t-shirt and shorts and sandals so that it won't be so hot. And with a bottle of water in hand, he was good to go. Yes, we needed to drive to the bus stop. Although it wasn't that far away, it was too hot walking to the bus stop at 10.30am. 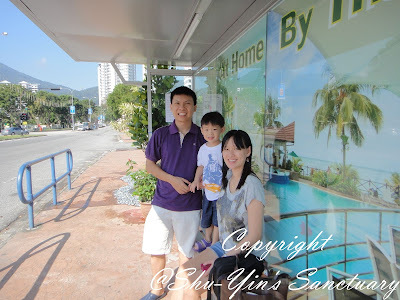 So 3 of us (Khye stayed at home 'coz he was too little for such expeditions!) together with Pho-pho took the car to the bus stop. Lol. The sun was glaring and shone right onto us at the bus stop. It was too hot to be sitting there, so what did we do? 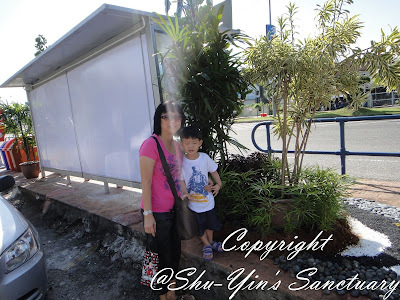 We stood behind the bus stop to avoid the scorching sun! Haha. Barely 5 minutes later, the bus arrived. 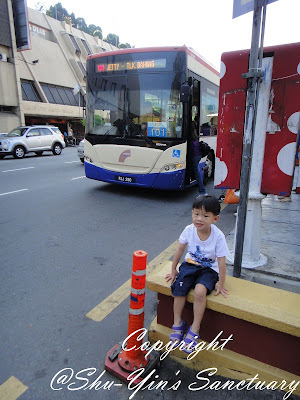 Our plan was to take the bus to Komtar. Have some lunch there, then we would take the bus home. The bus fare was RM1.20 for each adult. Shern rode for free. 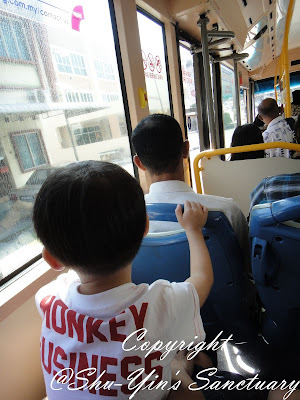 It was kinda difficult to tell him that there are no seat belts in the public bus, because I'd always told him that without wearing a seat belt, he would fly off! But luckily he did not question me much when I said no seat belts here. 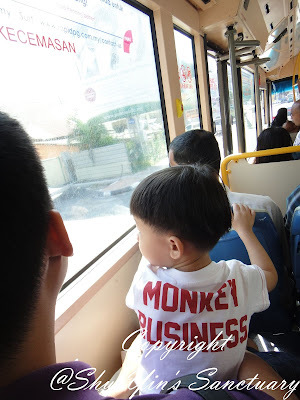 But for that seat the window was behind him, so it was difficult for him to view out. 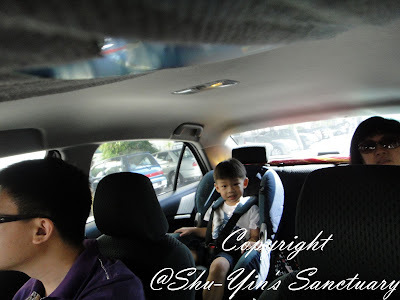 Then hubby found a seat somewhere behind and Shern quickly got into his lap. 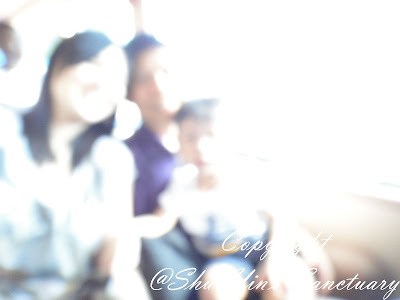 I somehow loved this overexposed photo of the 3 of us, so I will just post it here. Hehe. 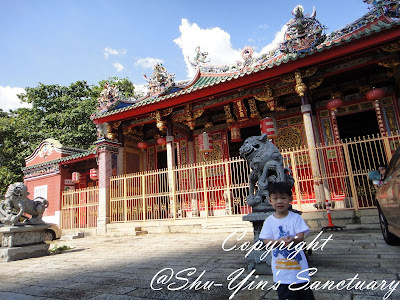 We let Shern pressed the bell and we got down at Penang Road, just outside the Ong Kongsi. 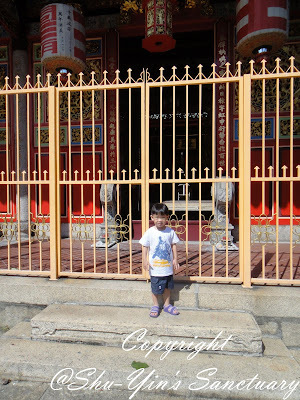 I grew up at my grandma's house behind this road and so I had some photos taken at this Ong Kongsi before. So mum suggested that we take some photos there as well. 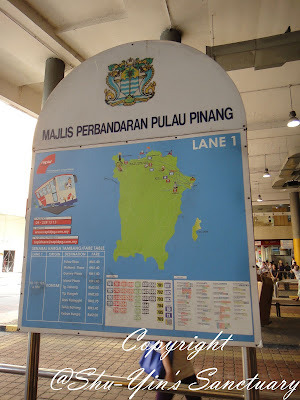 We then walked over to Prangin Mall and had lunch at the JL Gourmet. 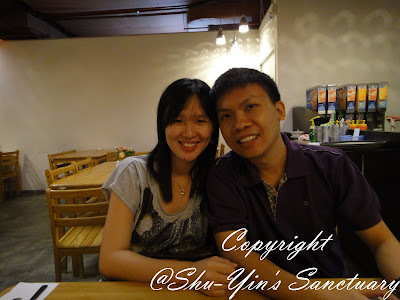 A photo of hubby & me. After that I went to Parkson Grand's nursing room to express my milk (the fate of the breastfeeding mum when Khye is not with me! 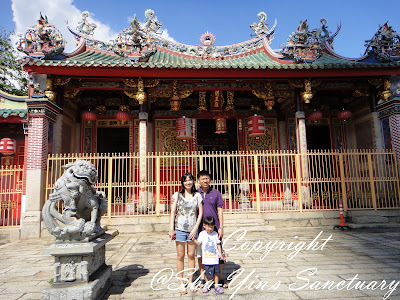 ), while mum, hubby & Shern browsed around waiting for me. After I'd finished, it was almost 1.30pm and Shern was tired because it was his nap time. 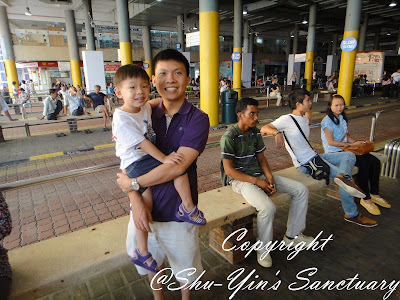 So we walked over to the Komtar Bus Terminal to wait for our bus. Saw a board which tells you which lane to wait in for your bus. The board was quite detailed and clear. And then I was so surprised and impressed to see this electronic board which tells you which lanes' buses are arriving in 5 mins or less. I guess they have a GPS system of some sort installed in all Rapid Penang buses. The only thing is that the board is quite small. We were in Lane 1 so we could read the board well. If you are at Lane 5 or so, then it would be too far for you to read the board. But nevertheless, I was still impressed with Rapid Penang. 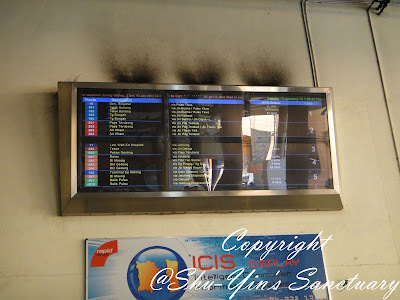 And just like just now, our bus arrived in 5 mins which we knew after reading the electronic board. In the bus, Shern fell asleep and woke up by me to press the bell.